Surprise on a story: Eagles, eagles and more eagles – Pamela Wood. One of the best parts of my job is going interesting places and learning new things. While working on a story about the Conowingo Dam — which was interesting enough itself — I learned that the dam is one of the top bald eagle viewing spots for miles and miles around. At one point, when I was atop the hydrolectric power plant part of the dam, one of the dam officials pointed out four — yes, FOUR — bald eagles sitting on rocks not far away from us. After my interviews and tour, I lingered a little bit at the dam to watch the eagles (and other birds) and shoot some photos. I couldn’t stay long, but I’m definitely planning a return trip. 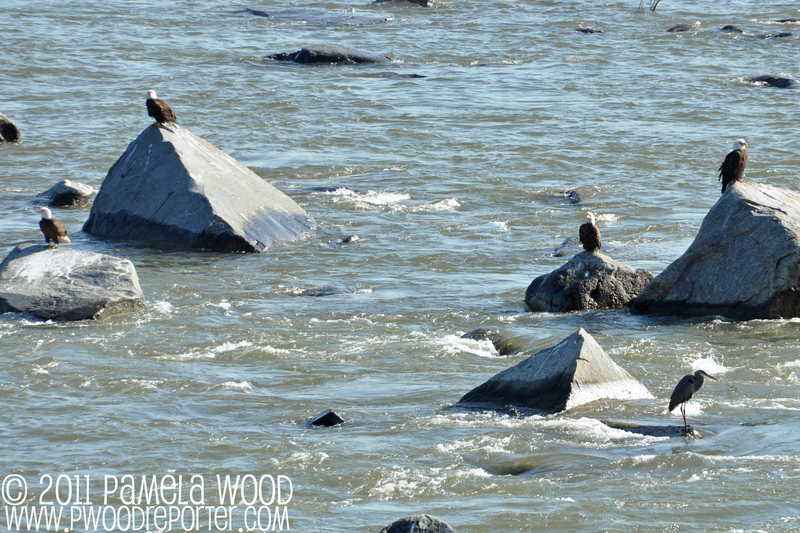 Why yes, that's one, two, three, FOUR bald eagles at the Conowingo Dam. And a great blue heron for good measure. The dam has a parking lot and an observation and fishing area that’s open to the public. Just pop “Shures Landing Road, Darlington, MD” into your GPS or mapping website for directions. The Conowingo Dam itself spans the Susquehanna River between Harford County and Cecil County, shortly before the river spills into the Chesapeake Bay. You can stop for a bite to eat in the town of Port Deposit a few minutes away on the Cecil County side. The new slots parlor in Perryville isn’t too far away either, if that’s your thing. I’m told November and December are prime eagle-watching months at Conowingo. 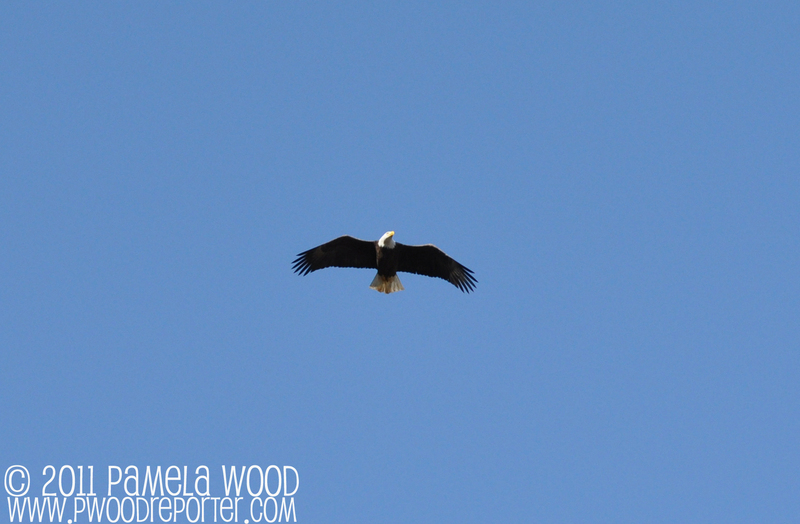 A bald eagle, flying right over my head near the Conowingo Dam.